The library has been a busy place this year. Students took approximately 180 Reading Counts tests and many received recognition in the monthly celebration assemblies. We were very fortunate to have Rick Riordan, author of the Lightning Thief, visit with us. Our students became very enthusiastic readers of the Percy Jackson series written by Mr. Riordan. One of the favorite activities was the creation of puppets. Students in the fourth and fifth grades created an animal puppet. After finishing the puppet, students then located a book on the shelves and read to their puppet. Many of the students read more than one book to their new friend. Library classes have gotten off to a great start this year. We will continue to have surprise events such as DARE Day, "Drop Everything and Read Day," and author visits. Check back often to see what we are doing this year. 3rd and 4th graders have started earning badges for their genre caps. Primary students are learning how to check out books, and proper care of books. 5th grade students are reviewing library skills including how to use dictionaries, almanacs and encyclopedias. Puppets are for all ages! 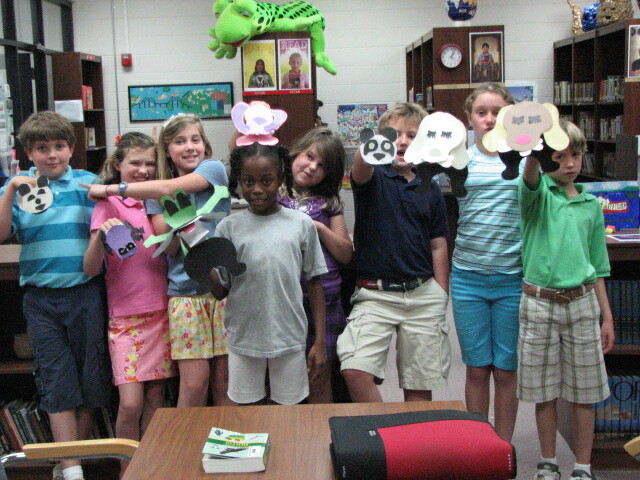 The Lower School students in library classes have just completed a unit on puppets. 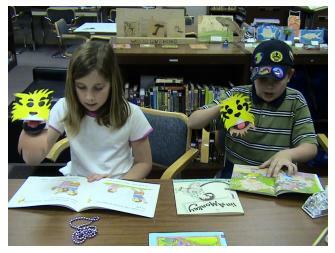 We made different animal puppets and then we located a book in the library about that type of animal. Each student had the opportunity to read their book out loud while having the puppet do the talking. On March 29, K-5 students gathered in the library to hear Christi Sanford talk about the process by which a book is written and published. 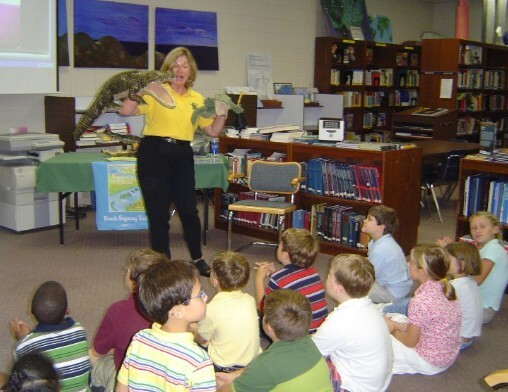 She read her three books about Legare, the Lowcountry Lizard to the students and showed them her original drafts of the stories. She then talked about how Legare's personality evolved when she collaborated with the illustrator, Warner McGee. Trident's own lizard, who remains nameless at this time, was also a vistor in the library. To learn more about Legare, you may contact Mrs. Sanford by email: clsandford@comcast.net. Additional photos. For the third year in a row, fourth graders are participating in a reading incentive program. They may earn stickers representing the genre of the books they read. When they have read two books in a genre, they receive a badge. 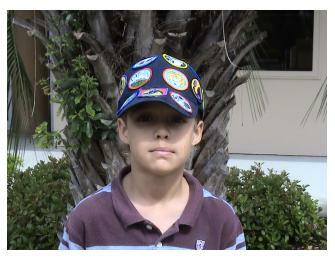 After earning 5 badges, they receive a baseball cap with the badges on it. This is the only cap that is permitted to be worn in school. Students love earning stickers and badges for their caps! Primary students were delighted by the special visit of the author and illustrator of Mr. Gator’s Up the Creek during their library class. (See the following write-up about the author's visit). The students were introduced to the library and a series of books by Mike Thaler when they listened to the Librarian from the Black Lagoon, and watched the Principal from the Black Lagoon. Other activities this period: Students watched as the librarian read and performed Robert Munsch’s story of what happens when students begin copying each other, as in Stephanie’s Ponytail. Students compared the classic tale of the Emperor’s New Clothes to the Principal’s New Clothers by Stephanie Calmenson. Other authors introduced were: Eric Carle and Audrey Wood. Second and third grade students were introduced to fold and cut stories. This technique involves cutting a pattern as a story is being told which produces an object by the end of the story. Students created a lighthouse by following the pattern as I told the story about where a little boy’s father worked. Some of the books that they have heard read or viewed this quarter include: Goodnight Gorilla, King Bidgood’s in the Bathtub, Jubal’s Wish, Make Way for Ducklings, Strega Nona, and Sylvester’s Pebble. Third grade students in my Wednesday class have been listening to The Whipping Boy, by Sid Fleischman. They have also compared two recipes in literature, one for Stone Soup, as told by Marcia Brown, and one for Mouse Soup, as told by Arnold Lobel. Fourth grade students have been busy earning genre badges for their caps. Seven students have earned their caps. Each week a new genre is discussed and the students are becoming more familiar with determining a book’s genre. Some of the genres that have been reviewed are: Poetry, Biography, Folklore, and Fantasy. For more information on genres: Literature Genres. 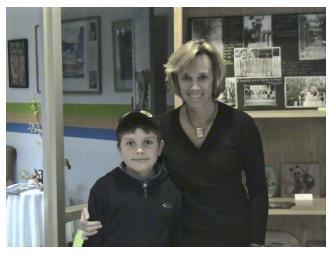 Fifth grade students worked on library skills and were introduced to some of children's most popular authors. Some of the activities in which students participated: Mapping out the library. Students drew a diagram of the library, and in great detail, located all the different types of resources in the library. Students worked on dictionary skills and used guide words to locate words in the dictionary. The video Tomes and Talismans reviewed how to locate books by using the card catalog and the Dewey decimal system. Met an author - Roald Dahl: Students visited Roald Dahl's web site to hear about his books and hear him talk about being an author. Students were introduced to Richard Peck and watched part of his video from the book Holes. Julie McLaughlin, author, and Ann Marie McKay, illustrator, visited lower school students to present their newest collaboration, Mr. Gator's Up the Creek. 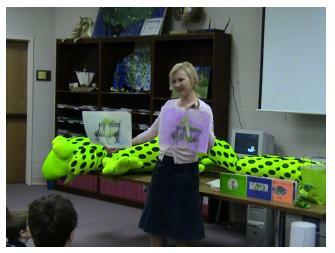 The local author read the book to the students and presented a puppet play. The illustrator brought her original artwork and talked to the students about how she collaborates with the author to create the drawings for their books. The library received an autographed copy of Mr. Gator's Up the Creek. For more information on the author and illustrator, visit their web page Mr. Gator.